The restrained, remarkably refined, and profoundly meditative figure of this “teaching Buddha”, ranks not only as one of the finest Buddhist representations but illustrates the embryonic development of the specific esthetic approach of the Koryo period (918-1392 CE). The technique, unconstrained by a certain rigidity and hieratic attitude that to a certain extent dominated the Unified Silla period (668-918 CE), has become much more flexible and fluid, displaying a genuine concern for realism and humanization. The pliant quality of wood, imitating the appearance and rendering of gilded metal, allowed for greater naturalism and facilitated the flowing treatment of the robe. The gentle, pure figure with its high bust, slim waist, very slightly arched shoulders and elongated face conforms to an increasingly refined canon of taste. On his headdress, the Buddha is wearing a half-shell of the kind which appeared during the Koryo period and which is also found in Chinese images from the Liao dynasty (916-1125 CE). 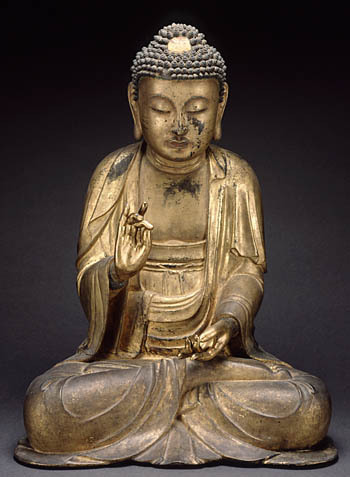 The teaching Buddha, more alive and more human, succeeded in giving expression to a highly aristocratic Buddhist faith that extolled the vision of an eternal, peaceful and harmonious world.The fall of the Chinese Tang dynasty (619-907 CE) was to have repercussions in the Korean peninsula. In 918 CE, the Unified Silla kingdom yielded to the new Koryo dynasty. Under constant threat from invaders on the northern frontier, the Korean people turned to Buddhism as their sole consolation. The new “religion” came to be regarded as a spiritual bulwark against foreign incursions and it was precisely during this period that the king placed the entire kingdom under the protection of Buddha. Led by royal and courtly example, the whole country gradually espoused the faith and Buddhist icons became increasingly widespread as expressions of a flourishing popular piety.